Millennials are far more likely to switch banks than other consumers. Nearly one in five said they switched banks in the last year, with many moving to online-only banks. Financial institutions can’t rest on their laurels, and must do more to retain this crucial demographic segment. Millennials switch banks twice as often as other consumers. According to an Accenture survey of more than 4,000 retail banking consumers in the United States and Canada, nearly one in five Millennials (18%) said they switched from their primary bank in the past 12 months, compared with 10% of consumers aged 35-54 and only 3% of people 55 and older. Though local/community banks were the biggest winners of this trend, 17% of Millennials who switched chose online-only banks. Surprisingly, slightly older consumers were even more likely to have switched to an online-only bank within the past 12 months, with 31% of consumers aged 35-39 years old saying they did so. Millennials also have distinct preferences for how banking services should be delivered. Two-thirds (67%) of them said that the traditional and digital banking experience they receive at their current bank is only somewhat or not at all seamless, and nearly half (47%) said they would like their bank to provide tools and services to help them create and monitor their budget. Nearly half (48%) also said they would like their banks to offer video chat on their website or mobile/tablet application, compared to only 30% over 55. 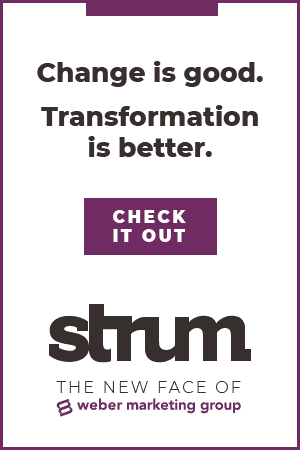 And while many banks and credit unions continue to add branches, Accenture’s research suggests that strategy isn’t the key to growth. 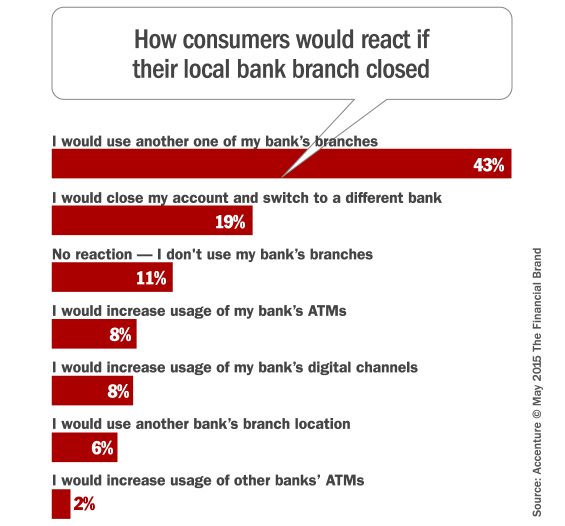 An overwhelming majority (81%) of consumers said they would not switch banks even if their local branch closed. This is a significant increase from the 52% of respondents in Accenture’s 2013 retail banking study who said they would be unlikely to switch banks if their branch closed. At the same time, 34% of consumers said that online is the most important channel for banks to invest in over the next five years, followed by mobile (cited by 20% of respondents). When asked what type of company they trust most with securely managing their data, the vast majority of respondents (86%) chose banks and financial institutions. This is more than 10 times the number of respondents who chose payment companies (7%), mobile phone providers (2%) or consumer technology companies (2%). Only 1% of consumers said they trust social media providers the most to manage their data. 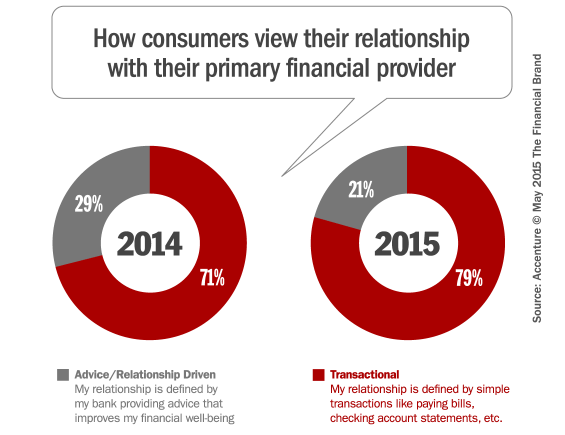 The survey found that most consumers (79%) define their banking relationship as transactional or commoditized, rather than advice-driven and offering high-margin products and services. These consumers said that their relationship with their bank is defined by simple transactions like paying bills and receiving checking-account statements. Though consumers overwhelmingly trust banks over other types of providers with their data, they are going to competitors for more sophisticated, high-margin products. For example, the majority of consumers said they went to other sources to purchase auto loans (70%), brokerage accounts (61%), retirement accounts (53%), financial advice (52%) and home mortgage loans (52%). In the Accenture study, consumers said they would be interested in several value-added services provided by banks, including: discounts for purchases (54%); proactive bill-pay services (53%); product recommendations (52%); end-to-end assistance with car buying, such as help with negotiating a loan and providing vehicle recommendations (49%); and buying a home (46%). Know the customers. Micro-segmentation allows financial marketers to understand customers better as groups, sub-segments and individuals. It guides banks to direct resources, develop products and service customers through individual interaction models and as part of an omni-channel strategy. Re-imagine the experience. 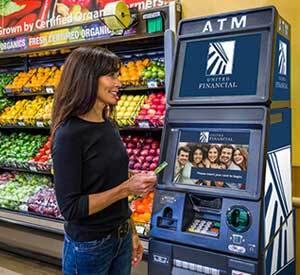 With analytics, banks and credit unions can create consumer-centered journeys that go beyond conventional banking encounters. 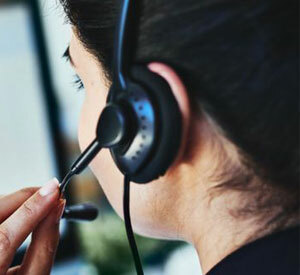 They can develop test-and-learn approaches, using data insight to inform continuous improvement efforts that reflect customer behaviors and feedback. Change the distribution mix. Considering the changing role of the branch and the growing importance of digital, financial institutions need to rethink the distribution mix to make the most of consumers’ changing patterns of channel usage. like merchant-funded offers — with explicit loyalty (points based systems), using the right data for an insight- driven, holistic loyalty program. Evolve into everyday banks. Banks and credit unions must bring multiple elements together—channels, customer experience, analytics, partnerships, digital platforms and innovation among them—to power a new Everyday Bank value proposition. Accenture’s 2015 North America Consumer Digital Banking Survey Report, “Banking Shaped by the Customer,” is available for instant download as a PDF (no registration required). This article was originally published on May 12, 2015 . All content © 2019 by The Financial Brand and may not be reproduced by any means without permission.